Thank you to all Students who applied to be a voice at Campbell Union High School District! Christine is a student and passionate advocate for student representation in our education system. As a Senior at Leigh, she hopes to develop an inclusive, welcoming school climate in all seven schools in the district. From proposing a bill on student representation to the State Board of Education, to working on several local school board campaigns, she is involved locally and statewide in helping students take charge of their own education by speaking up. She hopes to use her background and passion for student voice in her pursuit to become a social entrepreneur, someday. For the past four years, Christine has held multiple leadership positions, including: the Youth Action Summit of California Director in the California Association of Student Councils; one of three student representatives selected in California to serve on the Association of California School Administrators Legislative Policy Committee; a student advisor to the State Advisory Board in Education; and, an avid supporter and coach for Special Olympics Basketball. Through creating a Student Advisory Board at the Foundation, Christine hopes to bring together student representatives from each school to talk about pressing school climate issues and find eligible projects for funding. 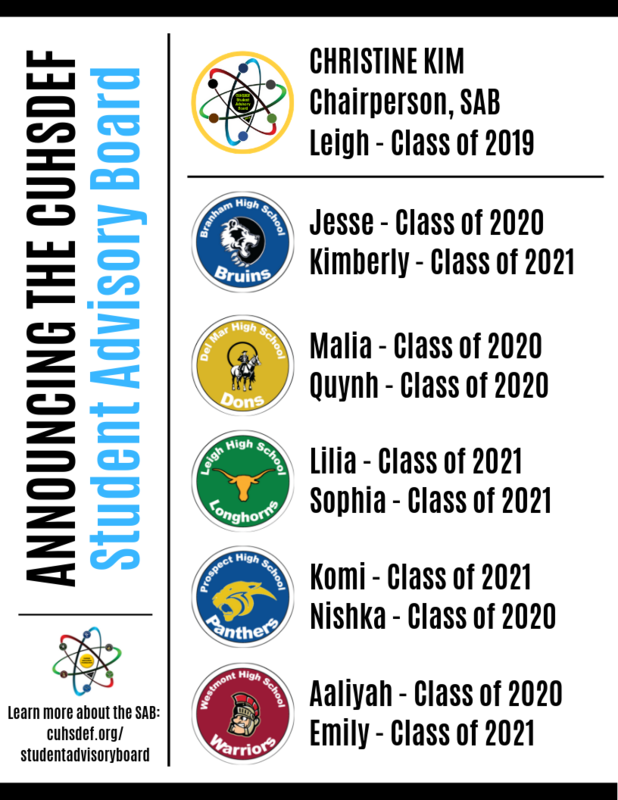 The Student Advisory Board will offer a safe platform for all students, directly at the heart of the district, who strive to encourage the next generation of student leaders.